Going back to the 1970s, there’s a whole subset of zombie movies that involve Nazis. (My personal favorite subset of this subset is the Nazi-zombies-emerging-from-bodies-of-water sub-subgenre.) Recent installments like the Dead Snow movies have taken a swing at this and now J.J. Abrams and his Bad Robots are having their say with Overlord. The first trailer has emerged from the mystery box and it’s a wild time for sure. Check it out after the jump. 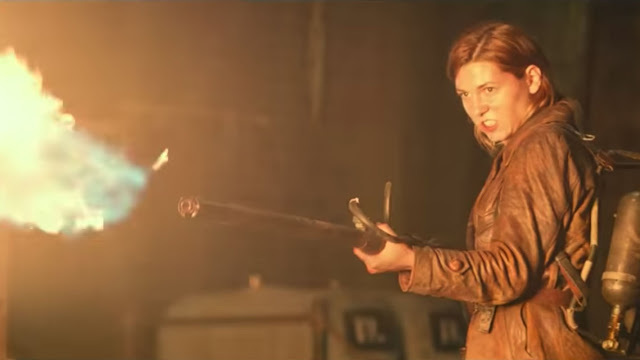 I’m way into this Overlord trailer. Let’s just hope it’s not somehow a covert Cloverfield sequel. Maybe they learned their lesson last time with The Cloverfield Paradox. For his part, Abrams denies any connection, but given the Bad Robot track record with the truth, people are bound to remain skeptical. It is, also, the company’s first foray into R-rated filmmaking, so there’s that. What starts out looking like a tense, grim war movie takes a much darker turn when a group of paratroopers drops into a Nazi-occupied village in France. And that’s saying something, because Nazis are pretty dark already, just look around. We’ve got Nazis, obviously, sinister medical experiments, war, flamethrowers, and AC/DC, which just ups the ridiculous factor exponentially. And as the trailer promises we’ll experience “chaos, fear, insanity…havoc, horror, evil…madness, terror, rage.” Yes to all of that. Where can I subscribe to your newsletter? Son of Gun helmer Julius Avery directed Overlord, and it stars Jovan Adepo, Wyatt Russell, Bokeem Woodbine, Pilou Asbaek, Iain De Caestecker, and Eva Magyar. The film opens on November 9, unless they pull some crazy stunt like they did with The Cloverfield Paradox, but that had more to do with the film being crappy than anything else, and Overlord looks like just the kind of bonkers Nazi-zombie movie I want.